Peterborough’s Century 21 Lakers have made two trades obtaining defender Chad Tutton from Brampton for goalie Tyler Carson and adding Mann Cup champion goalie Evan Kirk in moves GM Paul Day says are the beginning of putting the pieces together for the Lakers’ season starting June 4 at the Memorial Centre. Tutton is a 6’2” 220 pound Whitby native who lives in nearby Courtice. He was drafted second overall by Brampton Excelsiors in the 2014 major series lacrosse draft and is expected to be among the top five in this year’s National Lacrosse League draft. 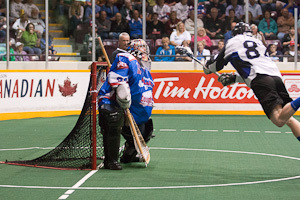 The 22-year-old defender played for the Whitby Warriors in junior and won two Minto Cups. He has played for Team Canada field lacrosse teams and is a senior for North Carolina ‘Tar Heels’ university’s field lacrosse team. He was the first Canadian recruited to the University of North Carolina by Tar Heels coaching legend Joe Breschi. Tutton is best known for his consistency, scoring at least one point for the university team in a 26-game streak. He has made the second team All ACC and was the team’s fourth leading scorer last season as a midfielder. In 2012 he was named outstanding freshman. He started box lacrosse in 1996, was a member of Whitby’s provincial champions in 2006, 2007 and 2008 and was chosen Toronto’s Hill Academy’s athlete most likely to succeed before heading to the States. Brampton received Lakers’ back up goalie Carlson as well as a third round pick in 2016, a second round pick in 2017 and future considerations to honour a former agreement with Brampton that didn’t happen before Day was hired as GM. Meanwhile to replace Carlson the Lakers obtained goalie Evan Kirk, 27, from Kitchener for a second round selection in 2016 and a second rounder in 2018 and future considerations. Kirk has played in the NLL for Minnesota, Philadelphia and is presently with New England. He was picked sixth overall by Minnesota in 2011 where he played with Lakers’ Andrew Suitor and Jordan McIntosh. He starred in U.S. college lacrosse and was captain of the Hobart team. He was also the Kitchener MSL goalie for three years with a top goals against average before being dealt to Six Nations in 2013. He won two Mann Cups and last season starred in the OLA playoffs with goalie partner Brandon Miller. In March of this year he was dealt back to Kitchener.